A pair of Midwestern migrants makes a surprise stop in an Upstate field. When amateur photographer Linda Montgomery got a call last June from her friend Rob Gentry, who claimed to have seen a scissor-tailed flycatcher (Tyrannus forficatus), she was skeptical but open-minded. 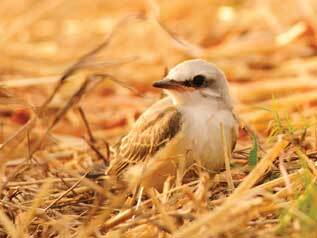 The scissor-tailed flycatcher, the state bird of Oklahoma, is rarely found this far east. "He calls me whenever he sees wildlife he thinks I should photograph," says Montgomery. She doesn't always follow up, but this time she did. Montgomery arrived to find not a single flycatcher, but a nesting pair tending a brood. What makes this bird so special is its tail, which streams behind it like a banner when it's in flight. It opens, like a pair of scissors, when the bird is landing, then snaps shut once the bird gains its perch. The outer feathers are white, and the ones on the "cutting edges" are dark gray. About thirteen inches long, the scissortail is one of only two North American birds with a tail longer than its body. (The other is the rare fork-tailed flycatcher.) Its body is a soft gray color with dark wings and a splash of orange in the "armpit" and on the top of the shoulder. Baby scissortails have the same color scheme, minus the orange splashes and banner tails. 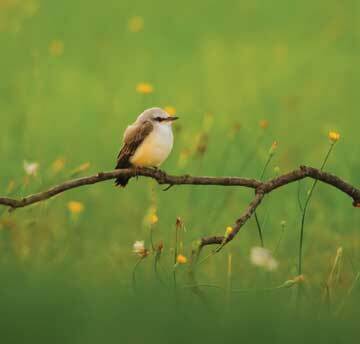 The first documented sighting of a scissor-tailed flycatcher in South Carolina took place in Laurens County in 1982. Rudy Mancke, at that time the Curator of Natural History at the South Carolina State Museum, remembers getting a phone call from Mary Riddle, of the Young's community, describing what she thought was a scissor-tailed flycatcher. He didn't think it was possible, but "the more she talked, the more excited I got," says Mancke. So excited that he left a meeting to go see the birds, which were nesting. They returned the following year, but have not been seen in those parts since. After the occupants fledged, Mancke collected the nest, which is now part of the museum collection. He was thrilled to hear about the pair nesting in Pendleton. "It's so much fun when you find something new like this," says Mancke. "It makes you re-evaluate your knowledge." This seldom-seen species is normally found in the south-central United States, but in recent years, the flycatcher has expanded its range and has been sighted in Utah, Missouri, and Tennessee. Purportedly, a pair has nested in Greenville County for the past two years, and in 1988, according to Mancke, someone took a photograph of a flycatcher near Clover, in York County. Somehow, the Pendleton pair was blown off course, or perhaps the two were descendants of scissor-tailed flycatchers that visited South Carolina, incognito, in the past. Mancke speculates that this bird may be one of many avian species on the move. "The range of birds has a tendency to be expanding all the time," says Mancke, who also has seen rufus and calliope hummingbirds become "accidentals," the appellation applied to species found outside their normal range. However the Pendleton flycatchers arrived, they made themselves at home at Simpson Research Center, a Clemson University-owned farm comprised of several hundred acres of pasture for livestock, fields for crops, and woodlands. 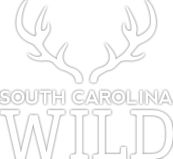 In 2009, Clemson converted 118 acres of hardwoods to pasture, removing a large tract of forest that supported many varieties of wildlife, including deer, turkey and coyote. 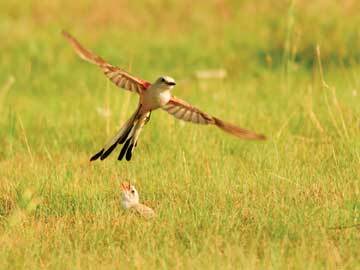 This clearing was bad for forest-dwellers, but benefited prairie-loving birds such as the scissortail, which prefers to nest in open grassland. 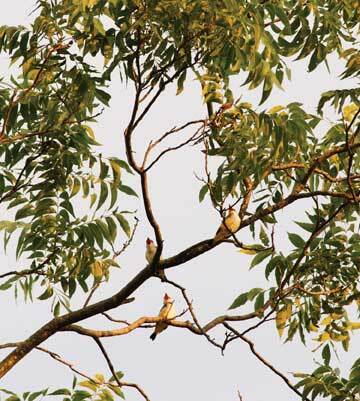 The Pendleton pair constructed their nest in the crotch of a telephone pole and one of its arms, along a two-lane road between a field and a stand of pecan and oak trees. When Montgomery arrived and started shooting, she observed four nestlings, as well as the parents flying back and forth on feeding missions. 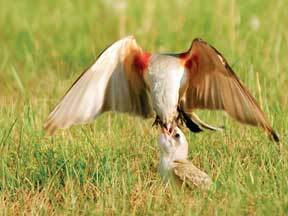 Mancke confirms that number is average for the scissortail, which lays from three to five eggs per brood. The mortality rate, according to Mancke, is "like that of most birds; about half," and the chicks fledge after fourteen to sixteen days. A baby flycatcher has a slightly disapproving expression when its beak is closed. However, when a parent appears with a juicy morsel, the nestling's mouth opens instantly, emitting a loud demand for food and displaying a gaping orange mouth that makes an excellent target. The parents were kept busy hunting for grasshoppers and other insects, which abound at Simpson, and stuffing them down the maws of their insatiable offspring. Montgomery observed that they also spent a lot of time resting on the telephone wire and occasionally dive bombing hawks and crows in order to protect the nestlings. The flycatcher's scientific designation, Tyrannus, or "tyrant-like," refers to this proclivity for attacking much larger birds in order to defend its breeding territory, according to the Oklahoma Department of Wildlife Conservation (ODWC) website. The scissor-tailed flycatcher's original Latin nomen was Muscivora forficata, which translates to fly (musca), devour (vorare) and scissors (fortex). 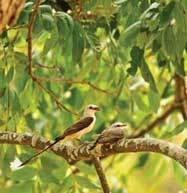 The bird also goes by the common names of scissortail, Texas bird-of-paradise and swallow-tailed flycatcher. Whatever its moniker, the bird is renowned for its beautiful courtship ritual. 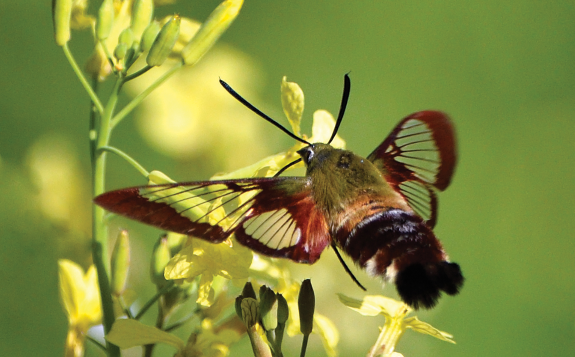 "The male makes a series of V-shaped flights, then plunges down in an erratic zigzag course, often somersaulting," according to the ODWC website. Its call resembles the squeaking of a rubber dog toy. Montgomery visited the nest every day, sometimes twice, after her first sighting on Sunday, June 26. One day, a nestling seemed to decide it was time to move on, spreading its wings tentatively until the wind caught them and lifted the bird away from the nest. About this time, Montgomery noticed that the nest still contained four members; apparently, the four she first observed had obscured a smaller member of the brood. Montgomery called this one the runt. Over the next few days, all but the runt vacated the nest. Life became more challenging for the parents, who then had to locate their scattered young, as well as a food source, before making their insect deliveries. They also continued to feed the runt and fend off predators. As the young became more mobile, Montgomery says, "They seemed to have personalities. The biggest seemed spunky." This most determined of the fledglings also followed his parents, pestering them for food: "If one of the parents flew to the wire on one side of the road, he followed; if the parent flew to the other side of the road, he followed." The runt lacked the confidence or size to leave with the others, which perched in the trees, badgering their parents to feed them. By Monday, July 4, all of the young had absconded, except for the runt, who finally ventured out of the nest. Perched on a telephone wire, it alternately preened its feathers or closed its eyes to snooze. A single parent divided its time between feeding the youngster and sitting beside it; perhaps the other parent was tending the other offspring. The runt seemed robust, Montgomery observed, but for several days after leaving the nest, it was on the ground, making it easy prey. Fortunately, it gathered enough strength to at least reach the safety of the wire. Mancke has hope that the birds will return next spring. He speculates that the flycatcher will continue to move northeast, expanding its range as a result of warming trends. "Nature is very resilient. Some species will make it, and some will not," says Mancke. If the intrepid pair in Pendleton is any indication, the scissor-tailed flycatcher will be one of the species that endures. 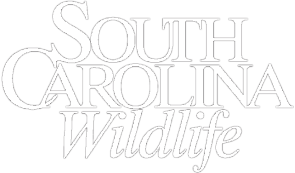 Note: Clemson University would like to remind the public that areas of the Simpson Farm property used for livestock research are subject to bio-security regulations and are not open for birding or other public access. All visitors to Simpson should check in at the main office on Lebanon Road before entering the grounds. Laura Garren is a Greenville-based freelance writer. 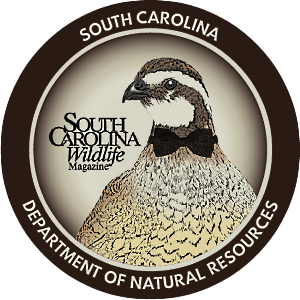 This is her first feature for South Carolina Wildlife.